We recommend prices be written on white tape and affixed to the sign face, which allows for easy price changes. 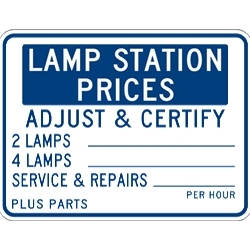 DOUBLE the working life of your Lamp Station Price Sign by adding 3M Protective Overlay Film (POF)! 3M’s high-tech POF protects sign faces against fading caused by the sun and harsh weather—and makes graffiti and sticker defacement damage easy to clear away without harsh abrasives. "I needed to purchase two new signs for my shop (California Smog Station). Stopsignsandmore had the signs I needed for immediate delivery, and that is a plus. The signs are high-quality and look like they should last many years."